Dogs title as Mans Best Friend has been around for almost 15,000 years. Currently, dogs are genuinely being treated like mans equal counterpart with their own specific clothes, yummy treats and even doggie hotels. Every dog-owner knows the energy consuming fiasco required with washing these furry pals in our kitchen sinks and bathtubs, along with the mess afterwards. For this reason, we have developed the Home Pet Spa that will not only make our life easier but your dogs more enjoyable. Easy to store in your garage, basement or laundry room, you can now keep your dog clean in the comfort of your own home without worrying about the groomer or the cleanliness of your home. Our unique design offers your dog a relaxing experience in our special dog wash with its strategically positioned jets and massagers, while you give your soapy furry friend the bath he needs with little effort. Eden Raised Garden Optional Enclosure (Enclosure Only) 2 ft. X 3 ft. The Eden Raised Garden Table Optional Enclosure (RGT-T23) is specifically designed for the RGT-23 or the RGB-ME. It will NOT work on any other structure. The UV protected covering with protective mesh netting to keep insects and rodent out, trap the sun's warmth while allowing air to flow within the garden. Your garden will also be protected from too much rain, wind, pets and any other animal roaming nearby. The Eden Raised Garden Table Optional Enclosure also has the ability to quickly remove the top enclosure if wanting to use the Eden as a decorative raised bed or to allow for larger vegetables or herbs to grow freely. Buy it once, buy it right!. Long lasting dog house offering 10-year manufacturer warranty made from ecoFLEX, a eco-friendly composite material. Maintenance Free and resistant to moist, warp, crack, or split. Non-absorbent panels and removable roof make cleaning easy. Attractive furniture like dog crate that doubles as an end table. Made with ecoFLEX, an eco-friendly and durable composite material. Stainless steel spindle with nicle brush finish has added a modern look to the table. ecoFLEX is non-absorbent, door resistant and extremely easy to clean. It assembles easily in 10 minutes or less with no tools required. 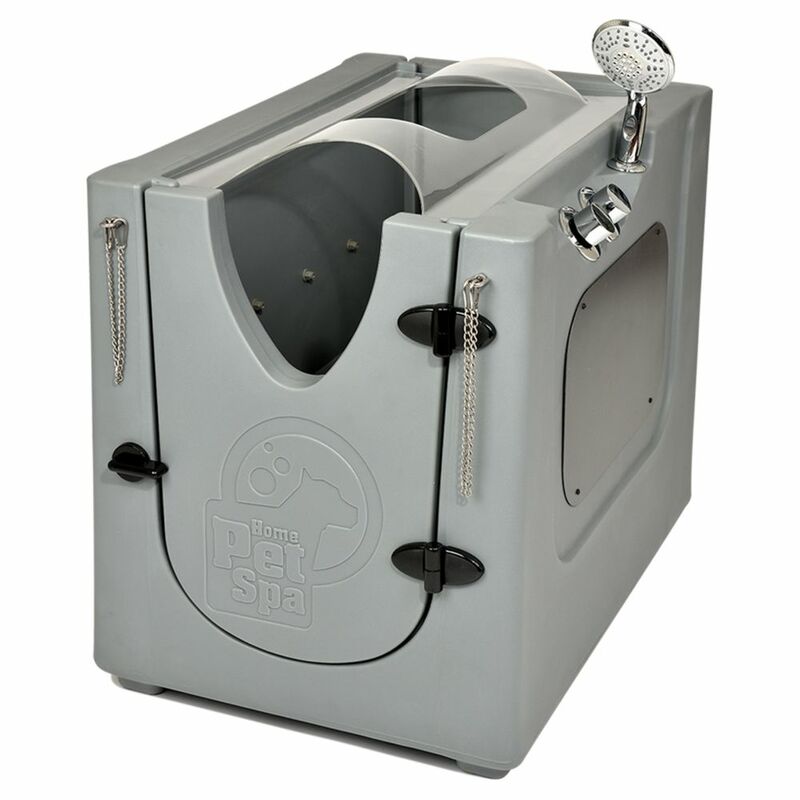 Pet Wash Enclosure with Splash Guard, Wheels & Removable Shelf Dogs title as Mans Best Friend has been around for almost 15,000 years. Currently, dogs are genuinely being treated like mans equal counterpart with their own specific clothes, yummy treats and even doggie hotels. Every dog-owner knows the energy consuming fiasco required with washing these furry pals in our kitchen sinks and bathtubs, along with the mess afterwards. For this reason, we have developed the Home Pet Spa that will not only make our life easier but your dogs more enjoyable. Easy to store in your garage, basement or laundry room, you can now keep your dog clean in the comfort of your own home without worrying about the groomer or the cleanliness of your home. Our unique design offers your dog a relaxing experience in our special dog wash with its strategically positioned jets and massagers, while you give your soapy furry friend the bath he needs with little effort.